Babette’s Feast, a short story by Isak Dinesen, was famously transformed into an elegiac Danish movie in 1987, winning an Academy Award for Best Foreign Language Film. Now, the tale has been transformed once again into a pleasurable piece of story theater, an example of low-tech stagecraft elevated with imagination and enthusiasm by a company of nine skilled actors, guided by director Karin Coonrod and playwright Rose Courtney. Also given major credit is Abigail Killeen, one of the production’s performers, for conceiving and developing the piece, originally produced at Portland (ME) Stage Company. The story takes place in the remote Norwegian town of Berlevaag during the 1800s, centering on two old-maid sisters, Philippa and Martine. They are the daughters of “the Dean,” the deceased head of a devout religious sect, whose modus operandi celebrated a charitable and austere lifestyle. While carrying on the tradition, the sisters take into their home a refugee from France’s counter-revolutionary bloodshed, Babette. Babette works for the sisters as a housemaid and cook, improving inconspicuously upon the household’s bland diet. But it’s not until many years later that Babette, who in Paris was an accomplished chef, has the opportunity to really show her culinary skills. The occasion is the 100th anniversary of the Dean’s birthday, and fortified by 10,000 francs in Paris lottery winnings, Babette asks the sisters for permission to provide a banquet. The sisters agree, but fearing the luxurious meal might turn out to be a “witches sabbath,” they ask the members of the congregation who will attend the banquet just to eat and not comment on the food. Despite their silent demeanors, the artistry of Babette has a joyously transporting effect on the guests, grown querulous and grumpy in old age and now – caught up in the glow of glorious food and drink -- are finding once again the warmth of their old friendships. It’s an affecting story, tying together several motifs – the passion of the artist, the goodness that can from the stranger in our midst, and the unpredictable but persevering human connections that can shape our lives. 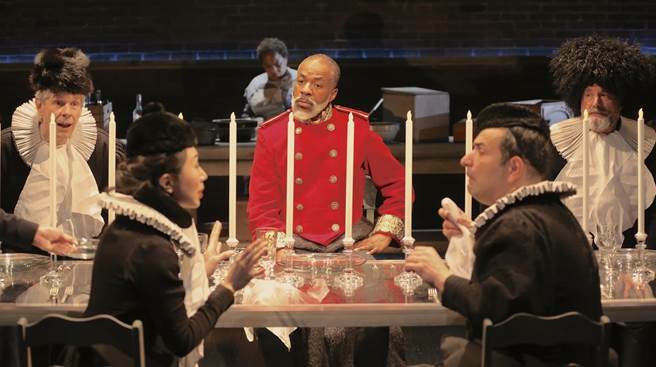 Babette’s feast indeed is shaped by such relationships, enacted in the play’s flashbacks. For one, Babette was sent to the sisters by a once-famous Paris opera singer, Achille Papin, who years earlier in a fit of depression traveled to Berlevaag. Once there, he became entranced by Philippa and her singing talents, so much so that he gave her lessons, planning to take her back to Paris. But that plan ended with an impulsive kiss, a kiss that also terminated the opera singer’s stay in Berlevaag. Additionally, there is the military officer Loewenhielm, whose youthful feelings for the pious Martine only intimidated him. Now, a general he has returned to Berlevaag, is invited to the dinner, and there is able to express to the guests the wonders of the banquet they are enjoying. They often cavort on the minimalist, moodily lit set (scenic and lighting design are by Christopher Akerlind) in choreographed movement, while also providing sound effects and pantomiming many of the props. There is at times a sort of underlying playfulness afoot, and it makes things seem a bit quaint at the start. 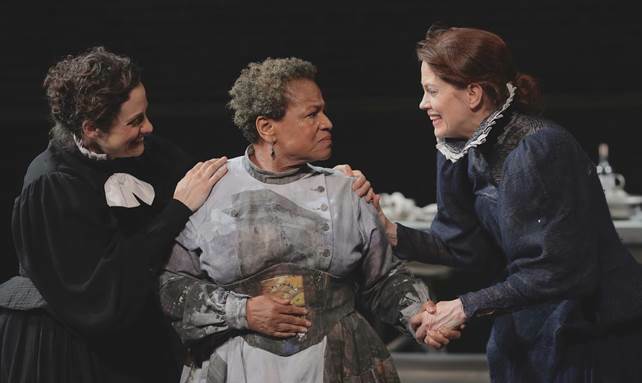 But eventually the humanity of Dinesen’s story takes hold, and even though Kelly and Killeen maintain their youthful look throughout the show, their deeply felt portrayals along with that of Hurst, make for some gently compelling – if not totally transporting -- storytelling. The story-theater mode, even with some eloquent speeches toward the end, tends to keep the proceedings just a trifle distant. That said, there are notable turns among the ensemble, including Steven Skybell’s realization of Papin, complete with a grand operatic duet sung with Kelly’s Philippa; Jeorge Bennett Watson’s confused and eventually suave Loewenhielm and Sturgis Warner’s display of kindly wisdom as the sisters’ father. And totally commendable is the synchronized byplay and vocal work, including choral singing, throughout the company, which also includes Jo Mei, Elliot Nye and Sorab Wadia. In the end, this version of Babette’s Feast may not satisfy completely your appetite for soul-grabbing drama, but it certainly provides a stage filled with well-prepared small plates.